There are moments that mark an epoch in your life as a gaming hobbyist. Experiences that define your tastes and attitudes towards videogames forever. These moments are rare – maybe happening once in each generation – yet stay with you forever. I shall never forget the first such moment I experienced. I had battled through a complex network or cliffs and rocky ledges, fighting hordes of robotic enemies, intent on my demise. Emerging weary and exhausted onto a rocky plain, it seemed as if the storm had passed. Then the screen halted and an ominous silence fell. Then I saw it – a gigantic metal fist floated into view above my head and began to try and smash me into the floor, its weight shaking the ground and making the speakers boom. I was terrified. I was exhilarated. I was hooked. A big, steel robo fist. Terrifying. And a bit random. The game in question was Turrican on the Commodore 64, and I had saved for a month to get it. I was a games-obsessed kid and this was the first title that gripped me so completely. The first game I played for hours and hours until I had completed it and found every secret. Even now the mere thought of playing Turrican gives me a thrill like nothing else I’ve experienced in gaming. For me, it was the turning point where gaming becoming far more than a distraction, and the platform-shooter became firmly fixed as my favourite gaming style. Sadly, Turrican is now a largely forgotten franchise, consigned to the pre-PlayStation era and apparently doomed to languish there. This is the story of Turrican, why it was so astounding and why it deserves to return. 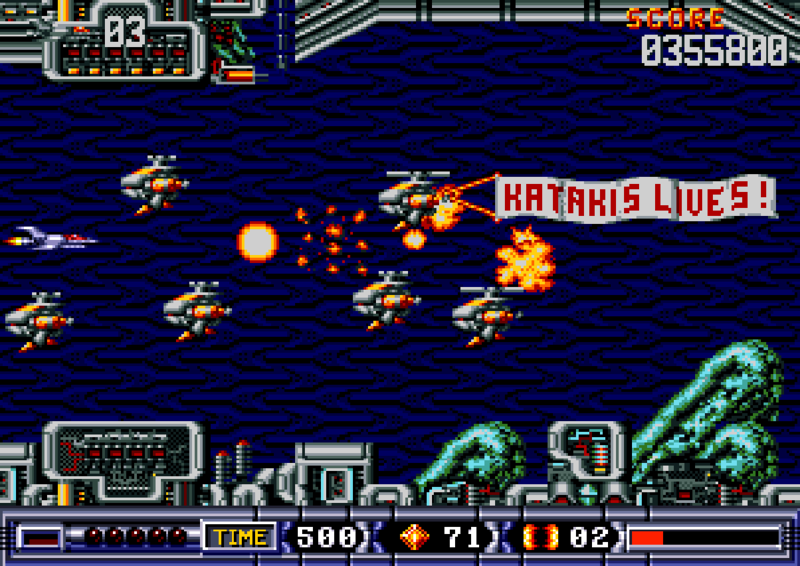 Turrican’s creator, Manfred Trenz, had made a name for himself in Europe by creating the visuals for the C64 version of R-Type, the side-scrolling shooter Katakis for the C64 and the visuals for the blatant Mario rip-off (even if it did play very well) that was The Great Giana Sisters. However, Turrican took everyone by surprise, storming onto the shelves in 1990 for Commodore, Spectrum and Amstrad 8-bit formats, dragging with it a tidal wave of accolades, awards and gushing reviews. It was an instant hit. Unusually for a non-licensed 8-bit title in the nineties, it found its way onto pretty much every system going, including the Amiga, Atari ST, Megadrive, NES, SNES, Game Boy and (rather bizarrely) the PC-Engine. One of the truly astounding features of Turrican, especially on the C64, was the gigantic boss battles. While the menacing fist mentioned at the beginning of the article is probably the most beloved and well remembered, there were a wide range of inventive behemoths for the player to contend with. From giant piranha fish to spiky robotic machines and a Gieger-esque three headed alien beast, Turrican’s bosses will long be remembered as some of the finest seen on 8-bit systems. Here you go, a giant three-headed… er… thing. Was quite tough, actually. At first glance, Turrican may appear to be little more than a standard ‘run and gun’ game with a loading screen unashamedly nicked from a ropey Manowar album (really). But appearances can be very deceptive. Turrican was really about exploration and had depth and beauty to spare. Playing like a hybrid of Metroid and Contra with not-so-sly nods to classic sci-fi films like Aliens and Terminator, the first thing that really hit you were the visuals. Trenz’s titles had always been graphically accomplished and had gone beyond what most people expected from a C64 game. But Turrican didn’t just push the envelope, it ripped it up, soaked it in petrol and set fire to it. It was alive with colour and threw hordes of detailed sprites about the screen with no slowdown whatever. Animation was fantastically smooth and the level design set a new standard both for complexity and size on Commodore’s humble 8-bit machine. As with most early games, the story was pretty thin. You assumed the role of a cyborg, sent to reclaim a synthetic planet from a rogue world-building AI (as you do). Your only defence? The titular Turrican armour (see ‘What’s in a name?’ box out). Your mission was to battle against the nefarious robotic creations of MORGUL (Multiple ORganism Unit Link) through the game’s five labyrinthine levels, each divided into multiple stages (including some decidedly tricky jet-pack stages). No easy task. Especially given the difficulty of the game which, although never unfair, required some seriously dextrous play, honed skills and perseverance if a player was to see everything that was on offer. 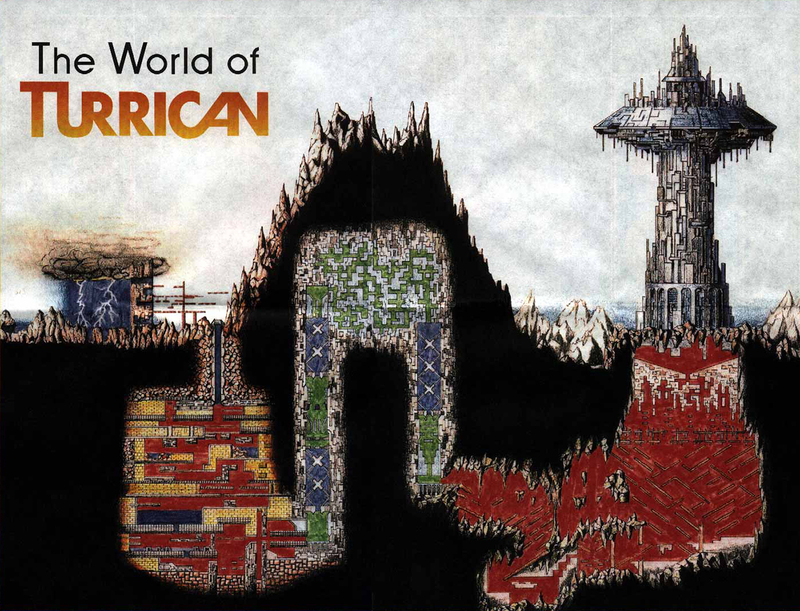 The Turrican world map. Massively simplified. Really. Turrican’s a bit of an odd name really. In fact, at one point a bit of a cult sprang up around trying to explain where the name had come from. A favourite was that Trenz had named it after a pizzeria he frequented called ‘Turricanos’. While Trenz did frequent a pizzeria called ‘Katakis’ (a name he used for an earlier game), the name Turrican actually came from ‘Turricano’ – an Italian name Trenz had found in the phone book. Utterly mundane, but true. 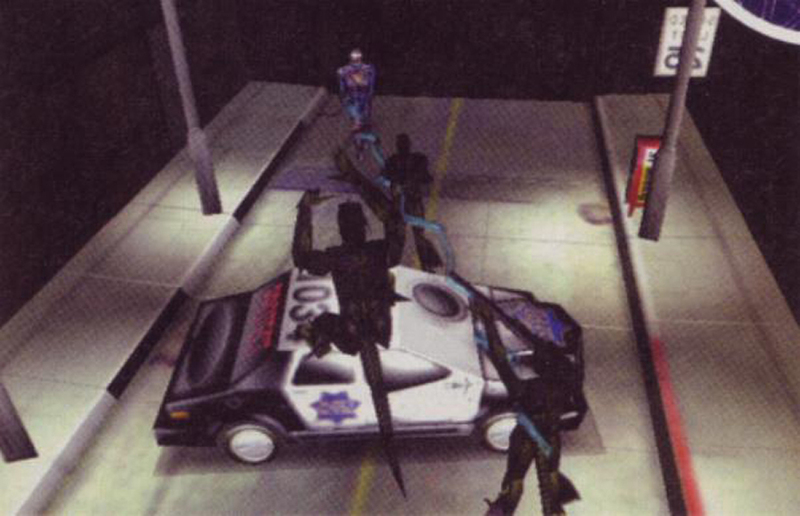 Thankfully, the tight controls, superb collision detection, non-linear levels, limited time-frame and perfectly balanced offensive/defensive system gave the player all they needed to be thoroughly challenged (I can certainly attest to throwing a joystick or two across the room) but ultimately successful. In fact, after many weeks of eye-drying concentration, my pre-teen self got the point where I was able to complete Turrican using just three lives. This tells me three things. Firstly, the difficulty curve really was perfectly judged. 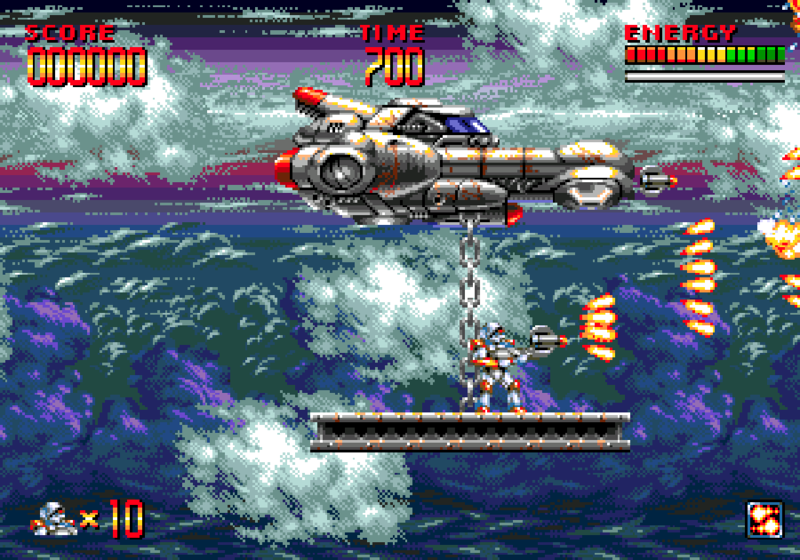 Secondly, after having gone back to Turrican after many years, my reactions are much, much worse than they used to be. Thirdly, I should probably have gone outside more as a kid. 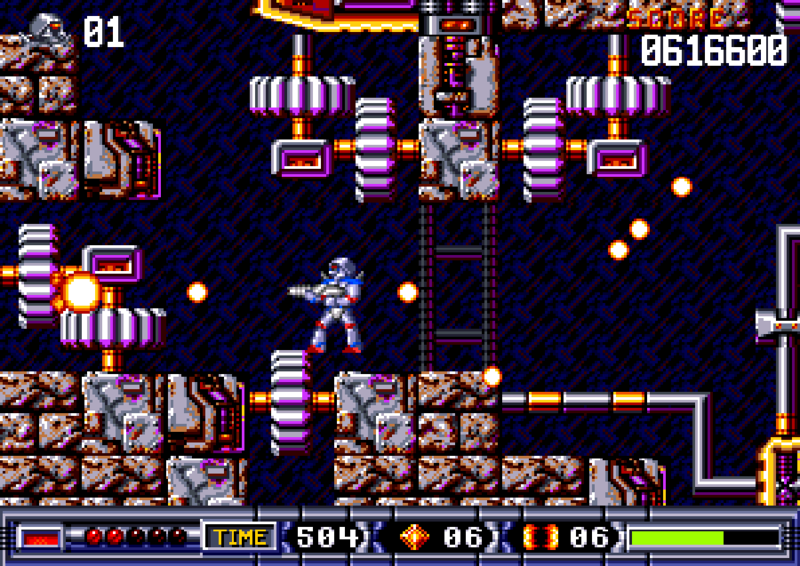 One of Turrican’s early levels. Doesn’t really prepare you for the challenge ahead. The power-ups in particular are a perennial favourite of many 8-bit gamers, providing an object lesson in how to implement a complex system efficiently and logically. This was necessary when you’re juggling multiple capabilities and only have a single-button joystick (yes kids, one button). Starting with a basic cannon, your capabilities seem a little on the weedy side at first. However, after actually reading the manual (something real gamers only ever do once they’re hideously, irretrievably stuck), you realised that you had much more destructive power at your disposal. Most famously, holding down the fire button caused a ‘lightning whip’ to spring from your character. This could then be rotated left and right around your avatar and used infinitely. Once fully powered up it reached clear across the screen, providing a valuable defence against distant enemies. While a powerful defensive feature, rather cunningly, you could only use it while standing still, so the game’s balance wasn’t compromised. Honestly, I have no idea. Some kind of giant robot eye thing? The standard cannon could be upgraded to offer a three or five way spread, a laser and, as you explored the levels, bonus items such as grenades, mines and the wonderful fire walls – destructive blasts that swept across the screen in both directions – could be accumulated and activated via a quick stab of a keyboard button. Crystals also littered each level which granted you an extra life for every 100 you collected. You usually needed these quite desperately. Despite the limited time you had to complete each stage, there was heaps to find and do (see ‘Secrets, secrets everywhere’ box out). This usually resulted in a bit of time panic as the clock ticked down to zero. It wasn’t quite the same level of chronic terror that the evacuation countdown in Alien Breed invoked, but it was close. They really don’t make ’em like this anymore. 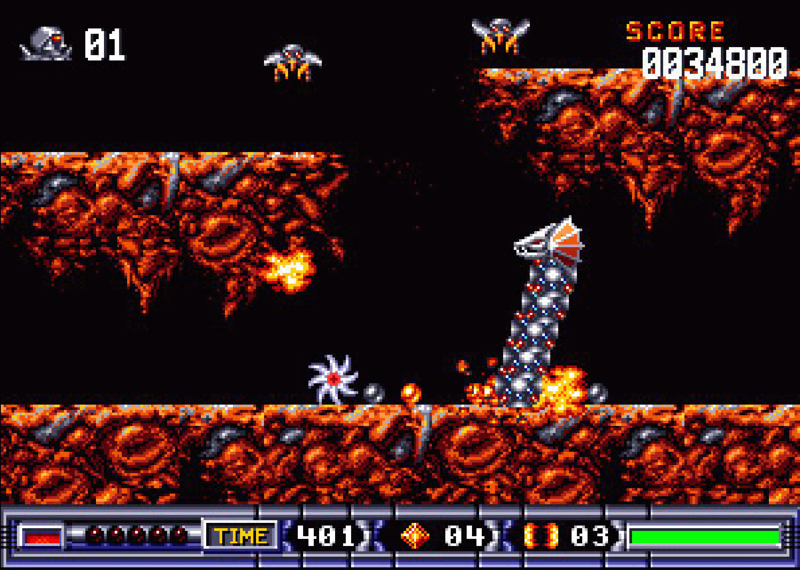 Turrican’s levels were filled with secret rooms and areas, usually reached by some hair-raising, pixel perfect platform exploits or by blasting through seemingly solid walls. These areas yielded a plethora of bonus items, power-ups, crystals and extra lives. Further bonuses could be gained from invisible ‘treasure blocks’ which appeared when shot. Some of these blocks gifted the player a screen full of items and made the exploration element of Turrican even more worthwhile. The lightning whip in action – discovering a hidden bonus block in Turrican 2. While the entire control scheme was fantastic, the real ace up Turrican’s sleeve was the ‘buzz saw’ mode. Your character could change into an indestructible spinning ‘buzz saw’ form just three times in each life. While you had no offensive capabilities in this form and could only travel horizontally or downhill, there were times when it was a real life-saver and it certainly added a tactical element to the game. Combine great level design, tight controls, a great offensive system, graphical finesse, technical polish and the wonderful Chris Huelsbeck score (see ‘A score to die for’ box out), and it’s easy to see why the game was such a huge success for Trenz and Rainbow Arts. A stand out feature of the Turrican series was the quality of the score. Each iteration was extremely well received and the only real letdown in the series was the poor quality Megadrive score for MegaTurrican. Although this was due mainly to the machine’s notoriously limited sound chip rather than any lack of ability on the part of the developers. The soundtrack was composed by Chris Huelsbeck (who also scored The Secret of Monkey Island and Rogue Leader), and remains a cult favourite today with a number of CD’s filled with tracks from the series available to purchase online (see here.). In fact, the soundtrack is so popular that in 2004 music from the Amiga version of Turrican 2 (the series highlight) was played live by an orchestra at the 2004 Symphonic Game Music Concert in Leipzig, Germany. There is also currently a fully-funded Kickstarter running that will deliver a complete orchestral score for Turrican 2. Which, frankly, is tremendous news for gamers with ears, taste and discernment. Naturally after such a smash hit, Rainbow Arts (the series publisher) was keen to capitalise on the game’s success as soon as possible. And so Turrican 2: The Final Fight (an utterly daft title – where are you supposed to go with a franchise after you’ve called something “Final”?) was swiftly readied and by 1992 we were tearing through an even larger and more detailed game world. All the features that had made Turrican such a critical and commercial success were retained, refined and improved. This was franchise creation done properly. No quick cash-in, no light graphical polish and “oh, that’ll do, let’s get it out the door while people still remember the first one” (a very popular method of striking while the iron was hot, back in the early 16-bit days). For starters, the offensive system was augmented with a few new options (bounce and plasma), the lightning whip was further refined, the graphics were even more accomplished, the level maps larger, insanely detailed and even more tightly designed. One fundamental change was the fact that the ‘buzz-saw’ mode could now be used as many times as you like, and could now lay tiny explosive charges along the ground as it rolled. One level sees Turrican shrunk and trapped in a really nice Swiss watch. It’s actually Rick Moranis in that suit. This would have seriously damaged Turrican’s carefully balanced gameplay and made it a walk in the park. But, with Trenz still at the helm of his baby, there was no way he was going to let that happen. To counter-balance the new gameplay elements, the difficulty level was increased. Yep, Turrican 2 was a proper toughie. Bordering on a teeth-gnasher at times. But you always made just… enough… progress… so that you didn’t walk away in frustration. And remember, these were the days of lives and continues. There were no save-points, no restart points. If you ran out of lives, you had to start all over again. Barely imaginable these days. Turrican 2 certainly was a challenge, but an instantly familiar yet new and exciting one for Turrican fans. Turrican 2’s buzz-saw mode. Perfect for confusing robotic dragon-worm-things. Perhaps the biggest departure from the gameplay of the first title was the addition of traditional side-scrolling shooter levels. 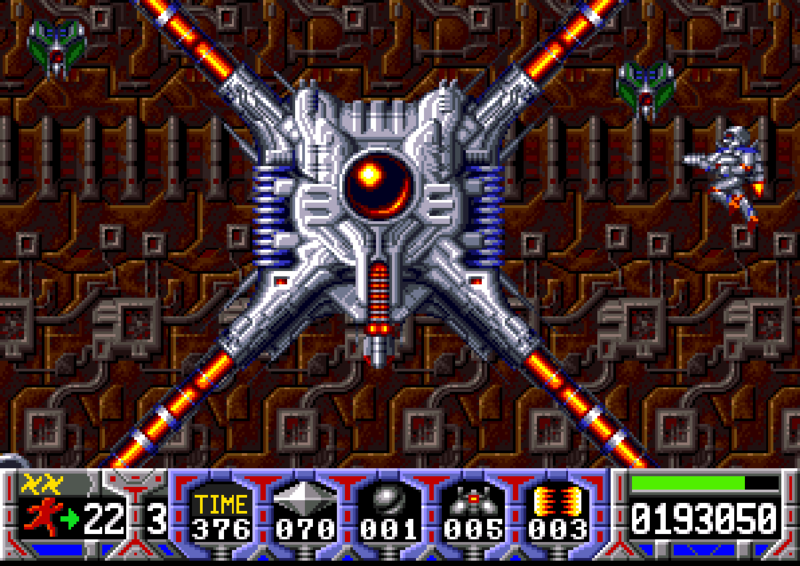 Here the player took control of a spaceship and blasted their way through wave after wave of enemies, in a similar style to R-Type or Denaris. This wasn’t some lazy ‘me too’ addition just to add something different to the back of the box though. There was real variation amongst these levels: from normal left-to-right side-scrolling to multi-directional navigation through twisting tunnels, or a level sped up to breakneck pace as the player wrestled to navigate their malfunctioning, speeding craft through narrow passages. 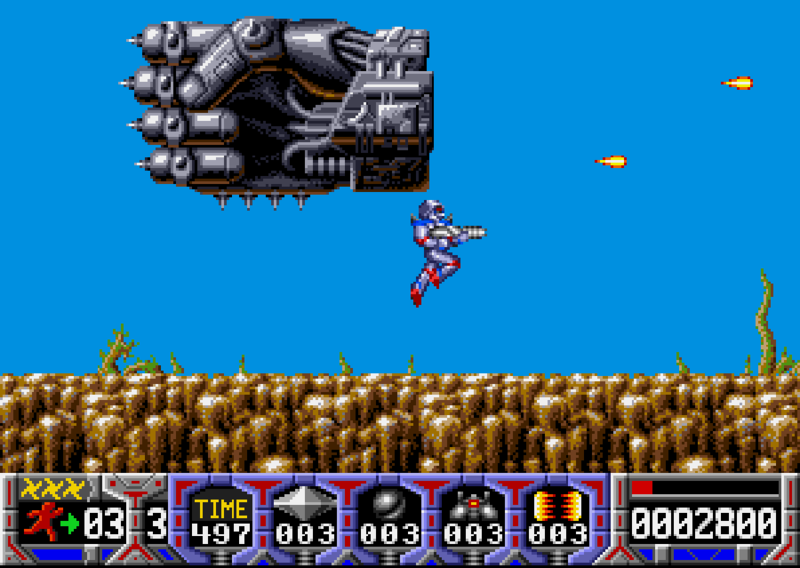 Such variety was most welcome and helped Turrican 2 – especially on the C64 and Amiga – attain its reputation as the best game in the series. If you only ever play one Turrican title, make sure it’s this one. But only on an Amiga or C64. Anything else would just be the equivalent of chugging fine wine from an old, chipped mug. It’ll be okay, but you’re really doing it a disservice. One of Turrican 2’s spaceship levels. In-joke ahoy. Unfortunately, this is where things began to take a turn for the worse. After a rather public and bitter disagreement about the future of the series, Rainbow Arts and Manfred Trenz parted company. Not wanting to look a cash cow in the mouth, Rainbow Arts (and later Factor-5) were keen to continue the series. So they pushed ahead with a third title for both 16-bit home computer systems and a number of consoles. Oddly, Trenz did go on to produce the superb and largely unknown Super Turrican for the 8-bit NES, a game that blended the first two titles, to excellent effect. Rather amazingly, he was solely responsible for all the programming, sound and graphics on this title. A pretty epic effort, by all accounts. Back in the 16-bit world, and without Trenz to guide production, Rainbow Arts seemed to miss the point of the Turrican series. When Turrican 3 was released for the Amiga and Megadrive (on which it was named MegaTurrican because… er… I have no idea, as it wasn’t that mega) it became clear they had pushed it further into the realms of a straight ‘run and gun’ game. Forsaking the exploration and expansive, non-linear level design that had made the first two titles such a joy to play, it was much more like a Contra game or Gunstar Heroes. Perfectly fine, but not Turrican. I should put a image of MegaTurrican here. But I don’t want to, because it’s rubbish. 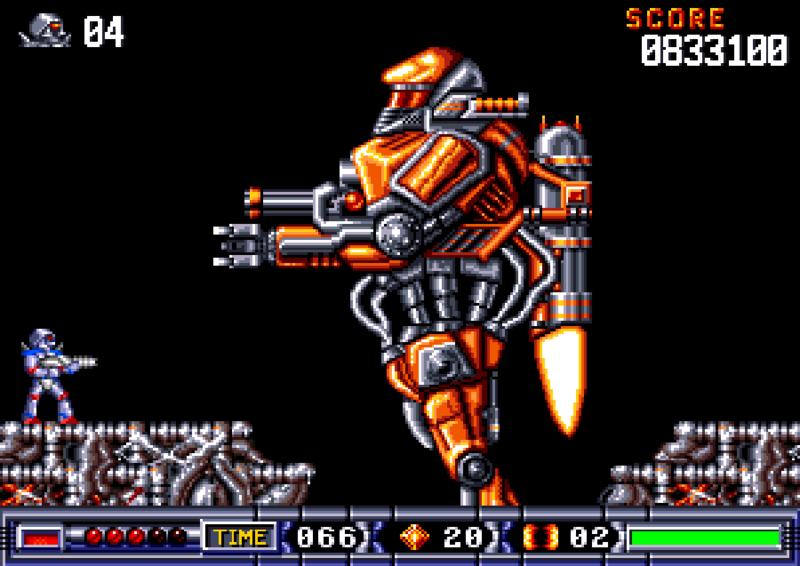 Here’s a fabulous Turrican 2 screenshot instead. This dude is three screens high. Three! 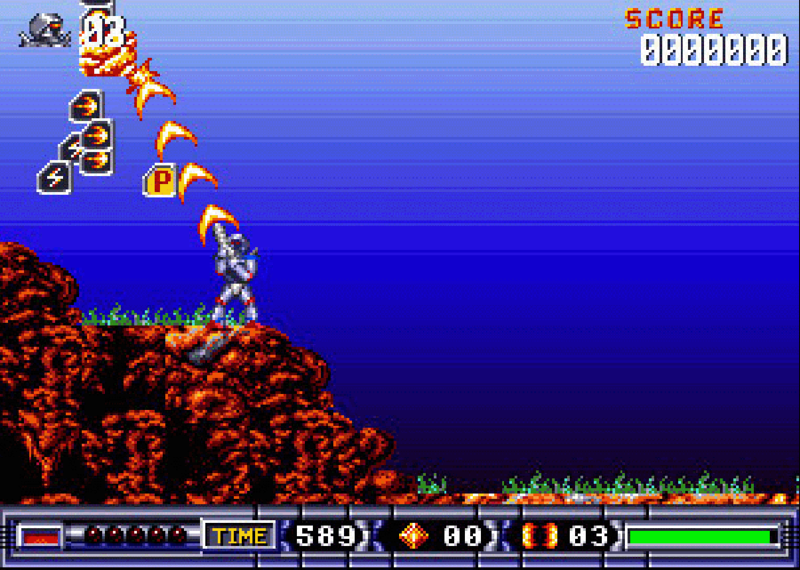 Rather more controversially, gone too was one of Turrican’s most unique features: the lightning whip. 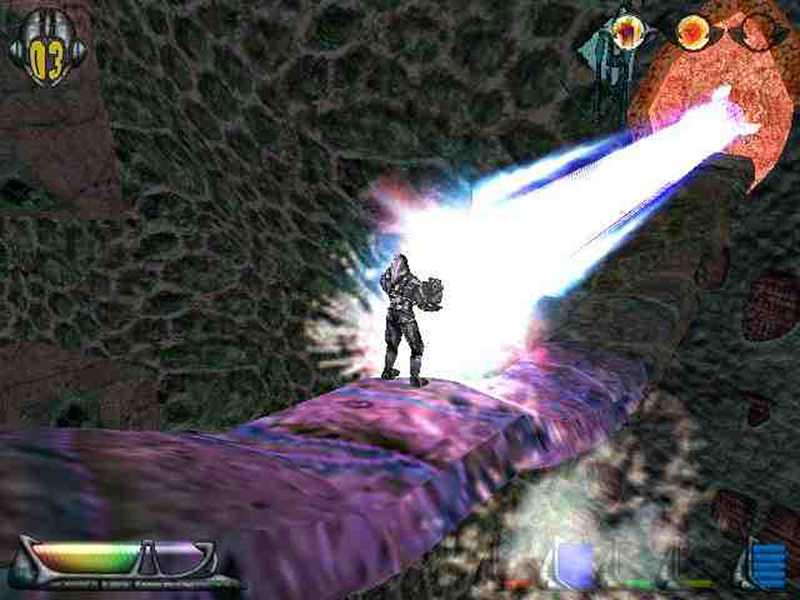 It was replaced with a ‘plasma rope’ that enabled the player to reach high platforms. A thoroughly pointless idea that destroyed the carefully designed and balanced gameplay of the home computer versions. That’s not to say that Turrican 3 was a bad game, it was just horribly average – something no Turrican title should be. Needless to say, when the game was ported to the SNES (oddly named Super Turrican, the same as its Europe-only NES forebear), a number of the elements that had been cut out were reinstated. The plasma rope was changed to an ‘ice beam’ which was similar in operation to the lightning whip. Invisible bonus blocks which had been replaced with bog-standard power-up chests were brought back and the general tone of the game was more in line with the previous games. 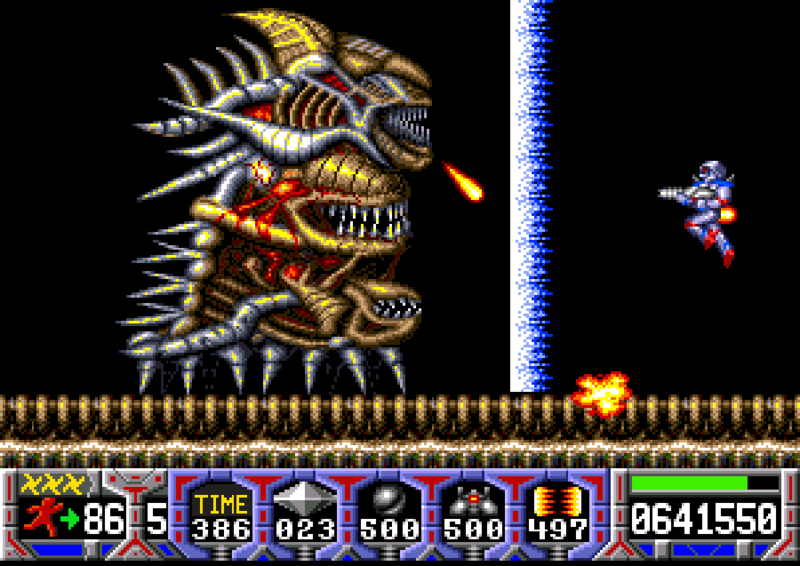 A further sequel, imaginatively titled Super Turrican 2 was produced and while it retained many features of the Turrican series – the spectacular boss battles were of particular note and among the best in the series – it was even more linear than Turrican 3 and had a dour, sombre tone that didn’t really gel with the rest of the series. Sadly, this was the last official Turrican game to be released and could well be the series finale. Not really a fitting swan song. Fine. Here you go, a MegaTurrican screen. Happy now? Harrumph. A THORNADO IN A TEACUP? Yet, the Turrican name still carried plenty of weight and many gamers were clamouring for a continuation to the series. There were particularly strong calls for a 3D version once the PlayStation, N64 and Pentium generation PC’s had become established. So it was that in 1997, Factor-5 (who had worked on previous Turrican titles and owned the rights to the series outside Germany) announced they would be releasing a Turrican title for the N64. Strangely, and against all common sense, this was to be titled Thornado. Meanwhile, Trenz and Allvision, in partnership with Rainbow Arts, were developing a PC title that would use the Turrican brand name. All a bit confusing, but we were potentially going to get two new Turrican games, so I was too a-quiver with excitement to care. The approach of these titles could not have been any more different. Trenz and Allvision wanted to give gamers a huge, free-roaming 3D world to be explored by foot and spaceship using a Mario-64 style control system, the traditional character and the classic weapon set. Meanwhile, Factor-5 were really pulling away from the game’s roots, offering a choice of players and wind-based weapons (hence the utterly daft Thornado moniker – honestly, what were they thinking). Sadly, neither title was to see the light of day. Thornado’s development was quite far along and in 2000 production was moved to the GameCube, a demo being shown to the press behind closed doors at the Spaceworld Show in Tokyo. 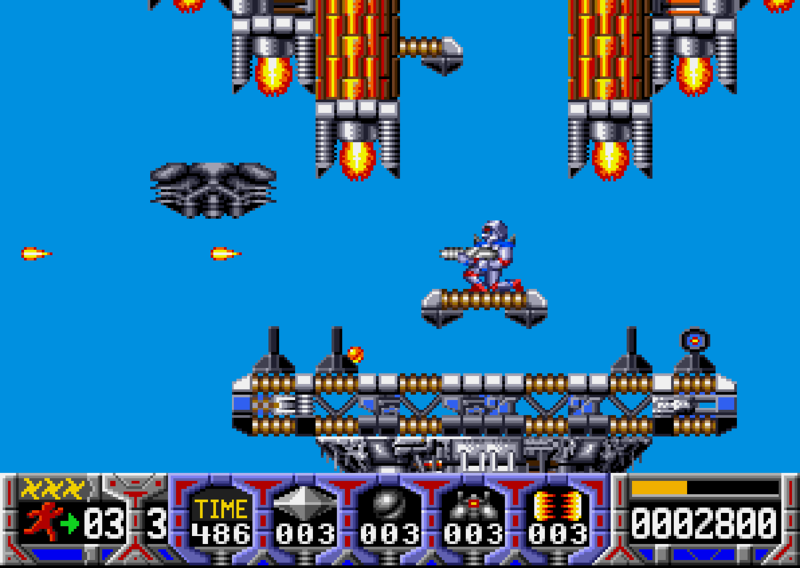 Turrican 3D – conclusive proof that, sometimes, 2D games should be left 2D. We never saw much of Thornado, other than some early, fairly grubby screenshots. So it seemed that Factor-5 held all the cards in the run-up to releasing Thornado. It’s very puzzling then that the project was shelved with no real reasons given. It just kind of sank from the radar and never resurfaced. This is even odder when you consider that Factor-5 obviously kept an eye on the prospects of the series as the trademark was renewed in April 2004. Despite Trenz wanting to revisit the franchise and trying to get hold of the rights, Factor-5 simply sat on them and allowed the Turrican name to become, for most gamers, a retro curiousity. Cue confusion and really rather annoyed Turrican fans getting quite irate online. Not that it did any good. Those of us that were real fans seemed doomed to enjoy our favourite franchise purely through existing copies on old machines, or via the dubious joys of emulation. A few years ago, Factor-5 were again looking at resurrecting the franchise, this time on the PS3 in the form of Turrican: Cyclone (again with the wind theme – not sure where they got that from). But once more, it sadly wasn’t to be. After the critical and commercial mauling that befell Lair, the plug was pulled on the game and it dropped of all release schedules. Other than some concept art, nothing really emerged from Turrican: Cyclone. Probably for the best. Rumour has it that, in February 2011, Manfred Trenz regained the trademark for his most famous creation. I hope that’s true, no one else should be at the helm. Things do seem to have gone a bit quiet lately though. No news of a comeback has surfaced and it really does seem that any chance of seeing a new Turrican game is gone forever. You have no idea how much it upsets me to type that. It’s a real shame that the Turrican series has been allowed to die in such an ignominious and protracted manner. It deserves better. Modern developers could learn much from the first two Turrican games; their levels were almost perfectly designed, the difficulty curve spot on and the control/weapon systems intuitive and implemented better than many a modern game. Of course, the big problem with any new “AAA” Turrican title would be the fact that it would probably have to be produced as a 3D title to compete in the modern gaming market. Trenz himself has gone on record as saying that he doesn’t think a 3D Turrican would work. I’m inclined to agree, the level design would be too confusing and the pace of the game would be slowed too much. 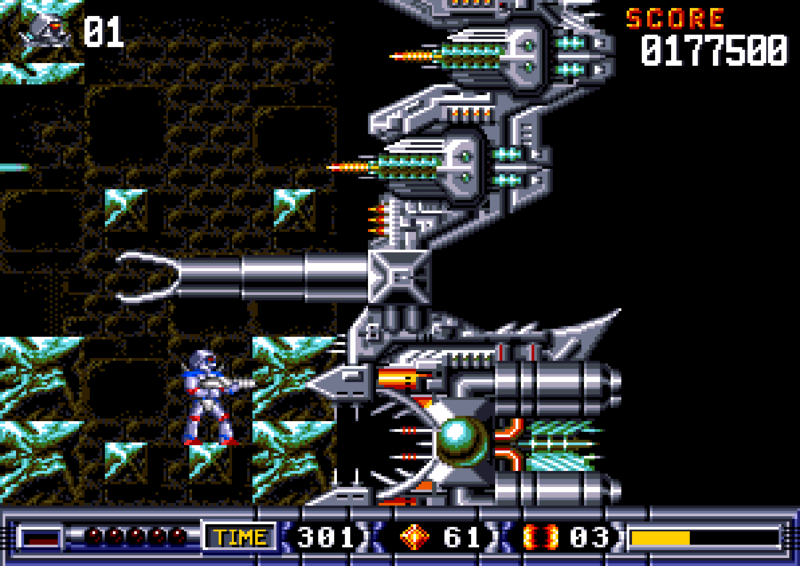 A 3D environment would also make the lightning whip and ‘buzz saw’ mode – key elements to Turrican’s unique feel – very difficult to integrate well. A ‘2.5D’ version would be the best compromise, with the protagonist running along a fixed plane. This would preserve the feel and spirit of the game while allowing for the spectacular 3D visuals that seem so important to many gamers. But who on earth wants a compromise? Personally, I’d much rather just see the first two games ported from the Amiga to Xbox Live Arcade. Maybe with a spangly set of shiny new HD visuals, some new levels and a new feature or two. But definitely in good old 2D. I doubt it’ll ever happen, but my word I’d be a happy bunny if it did. Whether there are any publishers out there brave enough to take a chance on such a venture in an increasingly homogenous and risk-averse market is another matter altogether. Yes, before anyone starts jumping up and down, I know the SNES/MD games (Super Turrican and MegaTurrican) are available via Wii Virtual Console. But these are not the best versions of Turrican. That would be the Amiga versions of the first two games. They’re also not remakes or new entries in the series, but emulated versions of the console games. There is, of course, a thriving fan scene surrounding the series. And there have been a number of home-brew remakes, homages and series continuations, many of which have been of a pretty high standard (especially the open-source Hurrican, which is available for Windows). In fact, I can heartily recommend that you have a look HERE where you’ll find all the Turrican related information and links you could ever need. Whatever happens to the Turrican series now, it will always hold a special place in my heart. Every time I pick up a controller to play a new game, for the briefest moment, I’m a kid again. Jaw slack, eyes gaping in wonder as alien worlds are brought to life before my eyes. For that I will be eternally grateful. Thank you, Manfred.